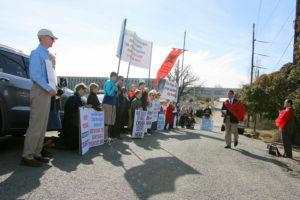 The battle against Satan crossed a new milestone at the Arkansas State Capitol, where 30 residents and volunteers from the American Society for the defense of Tradition, Family and Property (TFP) gathered to pray the Rosary and peacefully protest a proposal by the Satanic Temple to erect a Satanic Baphomet statue on state property. At 10:30 a.m on January 25, concerned Christians assembled to pray in opposition to the proposal. Half an hour later the State Capitol Arts and Grounds Commission met in Little Rock with the Satanic Temple. 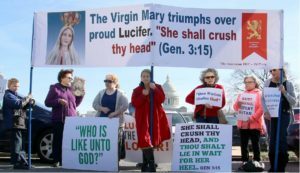 The Satanists, however, had to run the gauntlet through a row of peaceful and prayerful protesters wielding Rosaries and displaying banners. On the side of God, the prayer warriors did not miss a “Hail Mary” as a group of darkly dressed members of the Satanic Temple sneered and snickered at the peaceful rally participants. Judy is certainly not alone in opposing the Satanic offensive. 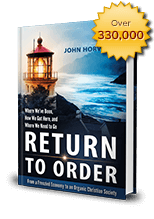 Return to Order has campaigned and collected more than 59,000 signatures nationwide to keep the Satan statue off State property. News crews arrived from local media sources such as Arktimes, KATV, Talkbusiness and Arkansas Democrat-Gazette Online to cover the protest. “The fight against Satan in Little Rock is not only for Arkansas but for the whole American nation.” TFP member Cesar Franco commented. He has come from Houston TX with a group of TFP volunteers for the anti-Satan rally. “The only thing necessary for the triumph of evil is for good men to do nothing,” as Edmund Burke said. So too, Americans are called to fight against the growing Satanic Revolution. All who love God hate the devil. Everyone is invited to sign the petition to keep Satan out of Arkansas State property. This entry was posted in Featured and tagged Arkansas, rosary, Satan, statue by Marc Vargas. Bookmark the permalink.